Once the location of the standing Cross of St John which marked the boundary between Edinburgh and the Canongate estate (owned in the Middle Ages by the Knights of the Order of St John). Charles I, on his first visit to Edinburgh in 1633, was ceremonially welcomed by the Lord Provost, whom he promptly knighted. 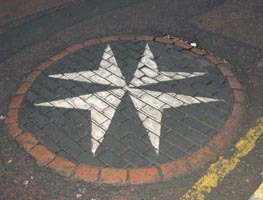 It is now marked by a Maltese Cross formed by cobbles set into the street outside No. 196.